The Powerbreather is being hailed as the future of swimming. It is designed to eliminate the need of swimmers to turn their heads while swimming. 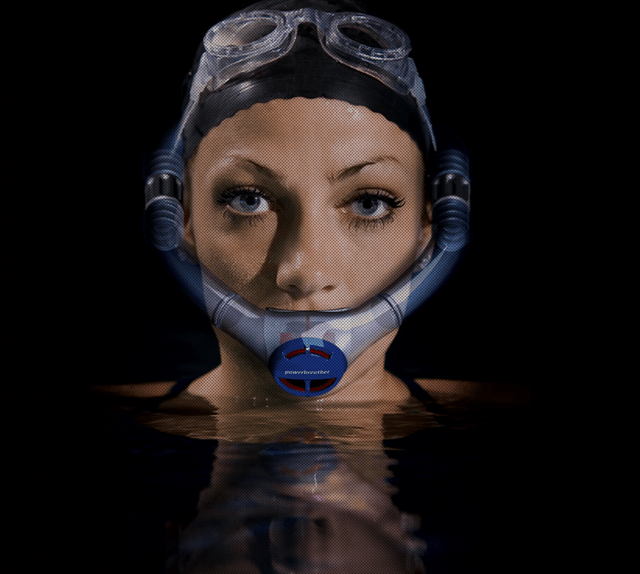 The Powerbreather Form Fitting Snorkel is made from elasticized material. This allows it to be adjusted so that it can be worn comfortably by any swimmer. The unique design of this snorkel also eliminates the fatigue affect that is often caused by snorkel use. Only fresh air is ever inhaled. This is possible because of the innovative valve technology that has been used. The design features two seperate valves. One valve is located on the back of the head and the other is near the mouth. The valve near the mouth opens when the wearer of the device exhales. All stale air is expelled. This is why the fatigue effect often associated with snorkel use is avoided. The valve on the back of the head opens when the user inhales to intake fresh air. The entire device is watertight so that no water can enter the air tubes during diving or swimming. Overall this seems like a great idea, it will be interesting to see how it develops over time.